Venice is always magic, but it is unique in the early morning when it's possible to “breath” something that will disappear some hours later. So this is the best moment to do something special... But what? If you love jogging you should try running along the desert “calli” and breath the morning air, while the town is waking up. I suggest you to wear your training shoes and run along the “Fondamenta delle Zattere” to understand the special link between water and land that makes Venice unique in the world. Il you prefer the quitest place in Venice you should go to Castello or the Giudecca and live the real environment of this city. Maybe you are lazy...Or you forgot tour training shoes...? There's no problem! 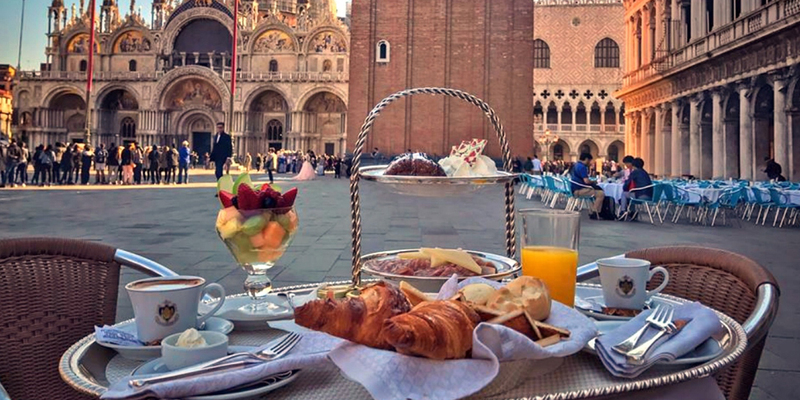 A walk in Venice is always possible, than you can add a good Italian breakfast with an “espresso” or a cappuccino and a sweet roll... Is it enough to convince you? You can arrive in Campo Santa Margherita, walking along the still empty “calli”. Here you can find the fish stand or the market stalls and then seat and have your breakfast with a timeless living postcard around you! Venezia is always charming in the early morning, also in the foggy days when mystery wrapped it up and in the summertime when a breeze arrives from the water to make hot more tolerable. So...Set the alarm clock early during your stay and you won't regret it!